The ParkNow app shows you all the nearby spaces. Select by location or based on parking tariffs. The choice is yours. Choose whether to buy time in advance or start and stop your parking. Make sure your vehicle details are correct, as this is how we recognise you have paid. Want to extend your stay or stop your parking? It’s a simple click in the ParkNow App. ParkNow simply charges your account! You can also download receipts. 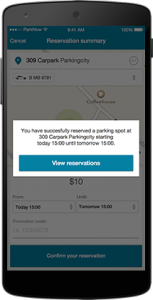 Motorists can look for their perfect parking spot in advance using the real-time ParkNow App. Some car parks offer advance reservations so you can book the perfect spot. Made a reservation? Just drive up to the car park and the gate automatically opens. Last minute decision to go downtown? No problem! Simply drive to the car park of your choice. When you’re ready to leave, simply exit the car park and ParkNow charges your account. It’s as simple as that.